MSR – Manufacturing Systems Research Inc.
For a limited time only, get a free should cost estimate of any part. Up to $2500 value. Free with no obligation. MSR's mission is to be the world leader in reducing manufacturing costs through accurate should-cost estimating. MSR was founded in 1979 as a supplier of Manufacturing Engineering Services to McDonnell-Douglas during the conversion of the Malton, Ontario plant to wing manufacturing. Our focus was on Tool Design, CNC Programming, Process Planning, and Cost Estimating. We continued to provide services to companies such as Rolls-Royce, Pratt & Whitney, Canadian Marconi, UDT, Cooper Energy Systems, Bristol Aerospace, General Dynamics and other Aerospace and Defense companies. What we do at MSR Inc.
At MSR, we are 100% focused on detailed, activity based, Should Cost Estimates of Customers’ components and assemblies. Prior to a supply chain negotiation, or an engineering design review, the customer designated representative supplies MSR with the data required to manufacture the component or assembly. This usually includes 2D drawings, Supplementary Product Information documents, 3D models, AMS or AS specifications, and any other pertinent information. We analyze material cost and usage, we calculate labor time and cost, all based on the manufacturing data provided and the activities required to produce the item. We submit a report to the customer in a universally readable and interactive spreadsheet format. The resulting Should Cost Estimates are fact based, accurate, and dependable. Customer use of these reports includes Design Engineering cost impact analysis, Supply Chain cost reduction and negotiating, and Product Information Management input with reliable and dependable data. MSR was founded in 1979 as a supplier of Manufacturing Engineering Services to McDonnell-Douglas during the conversion of the Malton, Ontario plant to wing manufacturing. 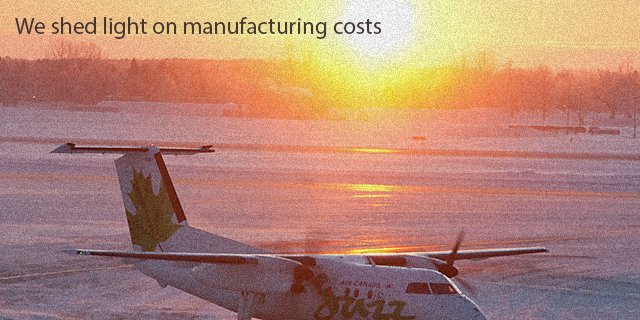 Cut costs by optimizing manufacturing processes. Improve quality at the same or lower price. Increase profits through higher margins. © MSR Inc., Manufacturing Systems Research.